Pumpkin Matè reminds me a lot of the smell of spices for pumpkin pie. It’s quite strong in that regard, and I do not really get the aroma of pumpkin when I smell it, which is a shame considering the ingredients. Pumpkin Matè is part of DavidsTea’s Fall 2015 Collection and is a limited edition tea for the season, something to keep in mind if you want to give it a try. Pumpkin Matè consists of: roasted yerba mate, butternut squash, pumpkin seeds, coconut palm sugar, natural & artificial pumpkin flavouring. The disappointing part of the ingredients is the lack of real pumpkin in the tea itself – they opted for butternut squash (delicious) and pumpkin seeds. 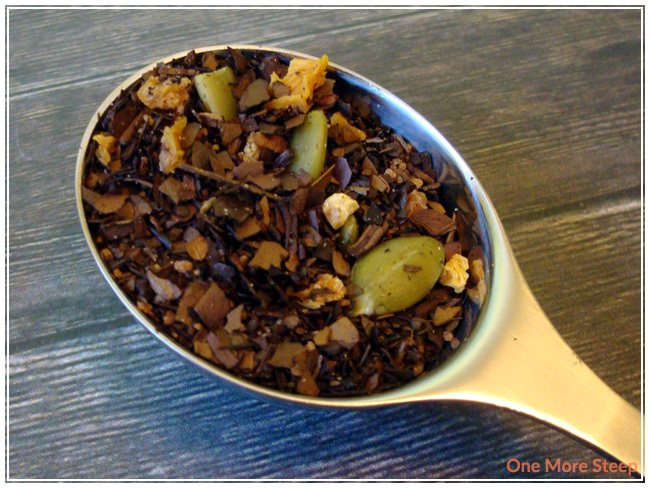 The squash and seeds are big and vibrant and stand out well in the tea, but how well will it translate in a cup of tea? For those unfamiliar with yerba mate, it is not an actual tea. Yerba mate is a South American drink that is high in caffeine. If you’re looking for a coffee replacement but still want the caffeine to kick start your day, yerba mate infusions may be a good coffee alternative. 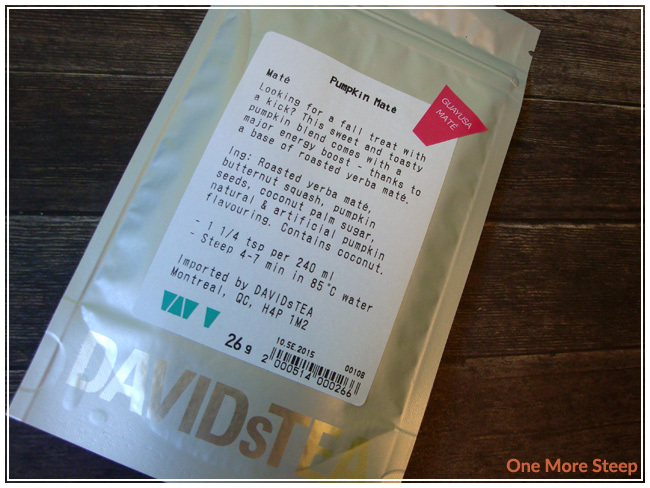 DavidsTea recommends that Pumpkin Matè be steeped in 85°C (185°F) water for 4-7 minutes. I wound up steeping it for about 5-6 minutes. I should really start using a timer when preparing tea. Pumpkin Matè steeps to a dark brown colour and smells a bit like pumpkin pie. There’s that sweet aroma and undertone of pumpkin, which I would attribute to the natural and artificial pumpkin flavouring, and smells a lot like pumpkin spice mixes. First sip and I’m pleasantly surprised by the earthy taste to it, the tea is more enjoyable that I expected it to be. The earthy taste reminds me a lot of pu’erh teas, which was surprising (but I also like pu’erhs so I’m not offended by it). While I can smell what I would say is nutmeg, allspice, and cinnamon – none of these are present on the ingredients list. Pumpkin Matè itself doesn’t taste spicy, but I also wouldn’t say that the pumpkin and butternut squash are strong contenders in the flavour profile – the roasted yerba mate overwhelms all of the delicate flavours and has a strong profile in this tea. Nope, Pumpkin Matè is good for one steep only. 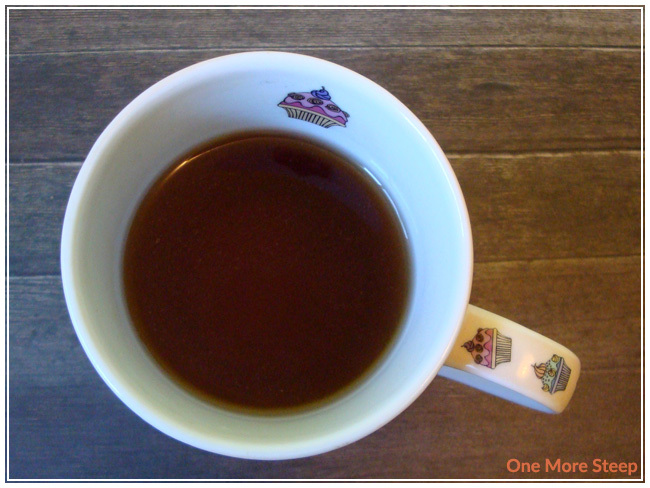 Resteeping the yerba mate resulted in a drink that tastes nothing like the original. It’s missing the sweet pumpkin aroma that was in the first cup. I thought that DavidsTea’s Pumpkin Matè was just okay. Honestly, I was torn between giving Pumpkin Matè one or two cups. One cup because it honestly does not taste like a pumpkin tea, which is what it should be because of the ingredients. On the other hand, Pumpkin Matè earns itself two cups because the taste is good. It’s earthy and is smooth, but isn’t quite as advertised. So while I did enjoy it, I won’t be stocking up on this one because there are better teas that could take its place.